Welcome to the Armor for the Ages web site. It offers information on the General George Patton Museum of Leadership at Fort Knox, Kentucky and the National Armor & Cavalry Museum (NACM) at Fort Benning, Georgia and the volunteer programs that serve both institutions along with news on projects, events and exhibits. It also offers information on the vehicles and weapons in the Military Vehicles section that have been or are currently in these museums' collections. This information consists of brief histories, technical observations and exterior and/or interior photos. Over time new vehicles will be added while others are dropped to make room. The hope is that, even though most of these vehicles have been extensively covered elsewhere, visitors will still find something new or interesting. Please access the drop down menus above to see how U.S. military history is both preserved and presented. Thanks goes to the volunteers that support these museums and the contributors who have generously added to this site through photos and materials. As always we wish to express our gratitude and support to all of the men and women serving in our armed forces worldwide. Our hope for everyone is a safe and speedy return home. 3-1-17 The News section has been updated with photos of a new project that the Patton Museum volunteers have started. They are working on the reasembly of a Huey helicopter that will be used in a Vietnam-era exhibit. 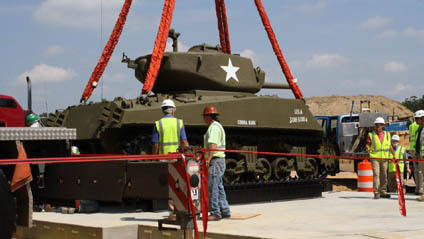 The Patton Museum and NACM are supported by foundations that solicit funding from private organizations and individuals. Except for their staffs and operating costs, no public funding is used to maintain their collections. Please take the time to donate to these worthy causes. The National Armor and Cavalry Museum Foundation. For questions or comments on this web site and its contents, contact Garry Redmon. Any information or opinions presented here are solely the owner of this site and do not represent the General George Patton Museum, the National Armor and Cavalry Museum, any attached organizations or any staff members. All photographs and other images are the property of the original contributers and may not be published or reproduced in any way without permission.